The Center for Cosmetic Dermatology offers the latest trends in the science of beauty and is dedicated to providing quality care individualized to reach your personal goals. We are the longest running practice dedicated to the field of cosmetics in Birmingham with over 20,000 procedures completed in the last decade. Dr. Shek is an innovator and expert in facial and neck rejuvenation. His superior skills, combined with the experience of over 40,000 cases, make him the number one Doctor in South East Michigan for these procedures. There is no close second. All new patient consultations are free. Once you talk to Dr. Shek you will understand why the most discerning patients choose him to perform their facial and neck rejuvenation procedures. Mitchell S. Shek, M.D., F.A.C.P. Dr. Shek received his medical degree from the Health Science Center at Syracuse, New York and graduated at the top of his class. He completed his internal medicine residency at Oakwood Hospital in Dearborn, MI where he served as chief resident. He then completed his dermatology residency at Detroit Receiving Hospital. He has advanced training in cosmetic dermatology and skin cancer excisional surgery. Certified by the American Board of Internal Medicine and Dermatology, Dr. Shek is a member of the American Medical Association and the Michigan State Medical Society. He is a fellow in the American College of Physicians and the American Society for Laser Medicine and Surgery. Dr. Shek is a published author in both the field of dermatology and internal medicine. He is on staff at William Beaumont Hospital and a volunteer faculty member for the dermatology department of Wayne State University. Dr. Michael Borkin is a Huntington Woods native. He graduated from the University of Michigan with a bachelor of science in kinesiology followed by earning his medical degree at Wayne State University. 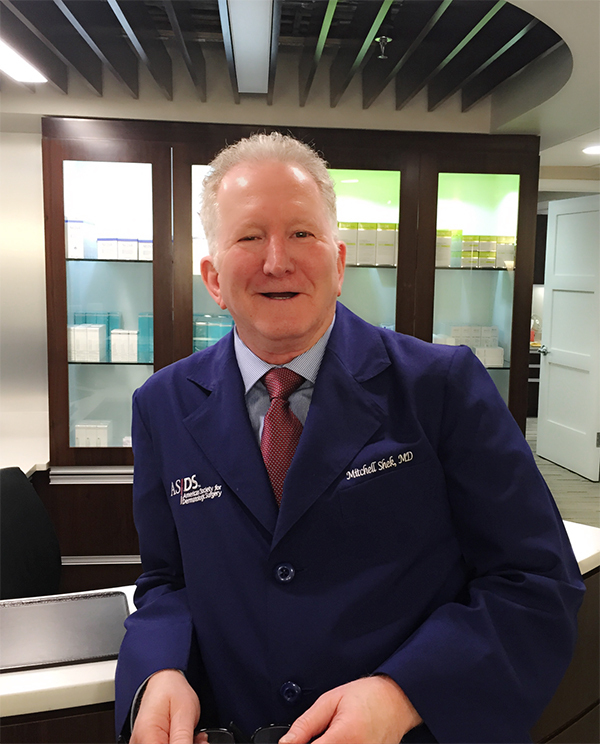 He completed his internship at St. John Hospital and then moved to New York City where he trained in dermatology at Columbia University College of Physicians and Surgeons at St. Luke’s-Roosevelt. After completing residency, Dr. Borkin spent one year working in private practice in NYC and also served as a clinical assistant professor in the department of dermatology at New York University. He then returned to Michigan and practiced in Southfield for a few years before joining us at Dermatology Associates of Birmingham. Dr. Borkin is married to Dr. Stephanie Marcus, a pediatrician at Merrillwood Pediatrics. Dr. Borkin is board certified by the American Board of Dermatology, a fellow of the American Academy of Dermatology, and a member of the Michigan Dermatology Society and the Michigan State Medical Society. He is on staff at William Beaumont Hospital and the St. John Health system. Nicole has been a licensed practical nurse for more than 38 years. She has over 20 years experience in the injection of leg veins (sclerotherapy), during which time she has developed a reputation as an expert in this area. She is also well trained in the removal of facial vessels, light and deep chemical peels and laser hair removal. She has safely and effectively performed over 10,000 cosmetic procedures at the Center for Cosmetic Dermatology.